4 Education Required Candidates who have completed Intermediate (F.A/Fsc) or Bachelors (B.A/B.SC,BBA or BS (hons 4 year). Pakistan Army has announced its recent Jobs for Join Pak Army through 143 PMA Long Course 2018 as Commissioned Officer Online Registration. 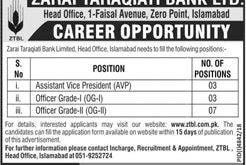 It best opportunity for F.A/F.sc Candidates who wanted to Join Pak Army. 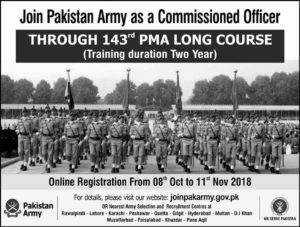 The Latest Advertisement of Join Pak Army through 143 PMA Long Course 2018 as Commissioned Officer Online Registration Apply Latest will Publish in leading Newspapers on Sunday 7th of October 2018. Initial Medical Test After passing initial medical candidates will undergo interviews. Shortlisted candidates of Interviews will given ISSB Call Letters ISSB Test-Interviews Recommended candidates will be considered for final selection after Final medical Examination at nearest CMH. Candidates are required to apply Online on Pak Army offical website www.joinpakarmy.gov.pk or visit nearest army selection and recruitment centers (AS & RC).